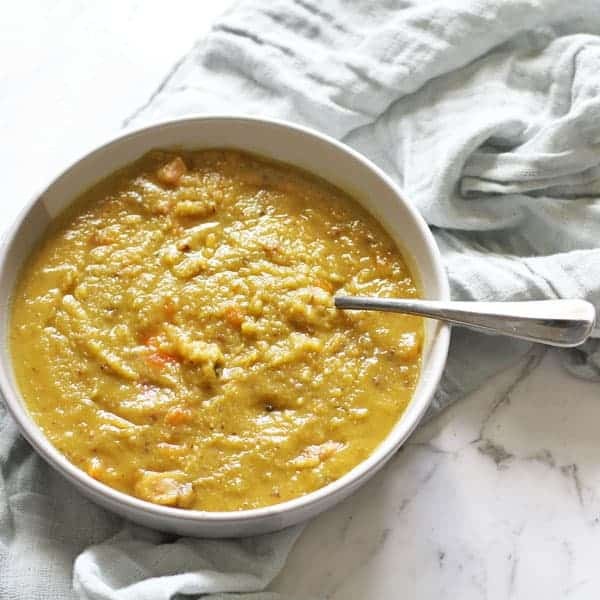 This Split Pea Soup is hearty, healthy and full of flavour. With very little prep and hands-on time, it’s the perfect winter warmer. Split Pea Soup, or “Pea and Ham Soup” as we call it, is ours. My nan makes it three times year, to mark each game of State of Origin. Yep – we have a family food tradition that revolves around the NRL (or football, for those of you not from Australia). We are die-hard Queensland supporters, and it’s just not Origin night if I don’t have a big bowl of Nan’s soup. Ok, make that two bowls – we only get it three times a year, after all. Nan’s soup is a labour of love. It takes more than a day to come together and you can taste every ounce of the effort that’s gone into it. I imagine the effort it requires is why she only makes the soup three times a year. Ain’t nobody got time for that, right? But the thing is – having Split Pea Soup only three times a year just wasn’t cutting it for me anymore. So I decided to try and make a copycat that took 1/12 of the time to prepare. And I’m happy to say – mission accomplished! This soup is as close to the real thing as you’ll get without having to dedicate an entire day to making it. That, my friends, is exactly what I needed! If you’ve tried this Split Pea Soup I’d love to hear how you enjoyed it! Pop a comment and a star rating below! 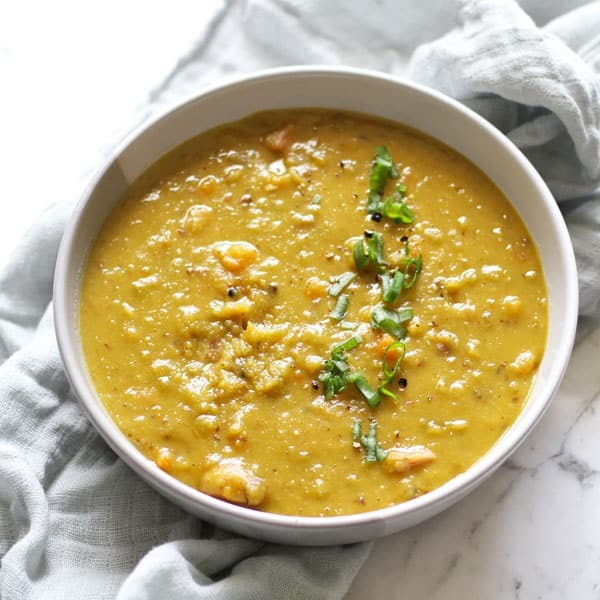 This Split Pea Soup is hearty, healthy and full of flavour - the perfect winter warmer. Melt butter in large pot on medium heat, then add onion, celery and carrots and cook, stirring often, until onion is softened. Season with thyme, bay leaves, salt and pepper, then add in split peas, ham hock and 1.5 litres of stock. Bring to boil, then cover and reduce to a simmer for 1.5 hours, or until peas are soft. You'll want to check on the soup at the 1 hour mark, and if it's getting too thick, add in some more stock. Remove the ham hock from the pot and onto a chopping board. Shred the ham off the bone and into bite sized pieces with a fork. Add the meat back into the soup and discard the bones and skin. Remove the bay leaves and serve as is or with some crusty bread. It’s such a comforting soup!